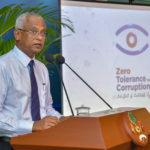 Solih assailed the “corruption and tyranny” of his predecessor. 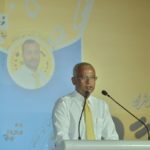 President Ibrahim Mohamed Solih on Monday assailed corruption scandals under the former administration as he urged voters to hand a parliament majority to his Maldivian Democratic Party in Saturday’s polls. 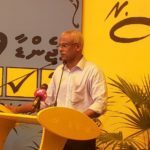 At a campaign rally in Malé for the MDP’s Thulhaadhoo constituency candidate, Solih spoke with uncharacteristic anger about the 25-storey Dharumavantha hospital in the capital, the most expensive publicly funded building in the country. The cost of project was inflated from US$54 million to US$144 million, he repeated. After an additional US$80 million was spent to purchase equipment and furniture, Solih said the new government faced difficulties in setting them up as the machines were too large. “When they are taken inside a room the door can’t be closed. Then we were forced again to spend more and change the doors to sliding doors,” he said. The public voted out former president Abdulla Yameen because of widespread corruption, he said. “We the people can only breathe freely after jailing those who committed grand corruption,” he added, in a riposte to Yameen’s recent remarks. A parliament majority for the opposition Progressive Party of Maldives and the ruling coalition’s Jumhooree Party was necessary to “breathe freely,” Yameen had said upon his release from pre-trial detention last week. Solih also slammed the previous administration’s flagship social housing project. He criticised the design of the apartment complexes under construction in Hulhumalé. 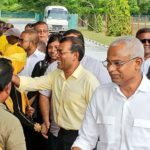 Solih went on to reiterate his plea for an MDP majority and stressed the importance of enacting the party’s legislative agenda in order to fulfil campaign pledges. 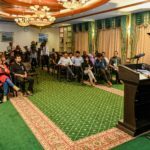 Despite the ruling coalition’s majority in the outgoing parliament, several crucial pieces of government-sponsored legislation have been held up, he noted. “No matter how much we redraft the bill, they will say it is unconstitutional. I don’t know what else we can do. All the bills we sent have been put on hold,” he said, referring to parliament’s refusal to pass a bill proposed to grant investigative powers to presidential commissions. 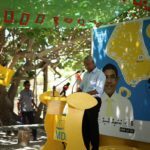 Earlier on Monday, Solih addressed the people of Haa Dhaal Nolhivaranfaru island and pledged development projects for the constituency. Before concluding a tour of the northernmost atolls, he also announced plans for school development, road construction and local tourism projects with loans from the new SME bank. Water and sewage service will be established on all inhabited islands during his five-year term, he pledged.